Surrounded by Beautiful, Lush Forrests! Just One Benefit of Being By The Oregon Coast! Is One of The Many Benefits of Staying With Us! We're One of The Area's Best Kept Secrets! Is A Bucket List Item You'll Never Forget! Has Room For All Sizes of Rigs! On The Banks of The Siuslaw River! Dock Your Boat Right Outside Your Front Door! Maple Lane RV Park & Marina is a locally owned business. The park was purchased in September 2017 by Larry MeChek & Elizabeth Hays with the intentions of making it a destination park. We have reconfigured some of the sites for easier parking, added several new trees and flowers as well as a new entrance and signage. Lots of fresh paint and stain. We’ve built a new fish cleaning station for our loyal fisherman. Larry & Elizabeth are very customer service oriented along with their camp hosts Darlene and Vance. We have lot’s of events in the works including Yoga classes by the river, karaoke nights and BBQ’s. We also are planning special events for Halloween, Thanksgiving and 4th of July — and anything else that we or our guests can think of. This park is a hidden gem located in breathtaking area that is close to the coast but has less wind and milder conditions than the coastal regions around Florence. The weather is cooler than Eugene with minimal days of high temperatures. The evening temperatures are wonderful for sleeping and the air is ripe with the smell of trees. Recreationists include off highway explorers, backpackers, hikers, mountain bikers, equestrians, aviators, nature-seekers and campers. These are all the things that make our RV resort very appealing to those who enjoy an active lifestyle and want to explore nature the way it was intended to be experienced. There are so many available recreational activities around our park that you will be able to do everything you could possibly want on your vacation. We have been fishing and camping the Siuslaw River in Mapleton for the past 24 years. Maple Lane RV Park is a “prime” location for salmon/steelhead and blueback cut throat trout fishing that you will find anywhere on the Central Northwest Coast of Oregon! 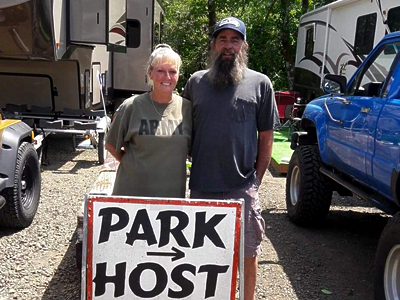 This RV park has always maintained a friendly, family atmosphere with lots of camaraderie, good cookin’, potlucks and loads of fun. You will find the owners to be very invested in providing a quality experience at Maple Lane and the camp hosts ready to meet your every need, making you feel right at home! 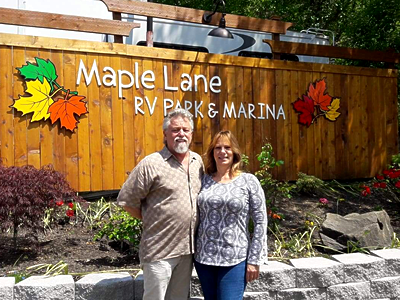 Maple Lane RV Park has been our home away from home for 24 years and will be for years to come! We love it here so much that we travel 2000 miles round trip every year to be here with our friends & fish! One of the best parks we’ve ever stayed at. The hosts were simply outstanding – helpful, friendly-even gave us free ice. Hookups were great and worked well in a beautiful setting on the river. The area is heavily treed and very quiet. Showers and bathrooms were homey-clean and well maintained. The setting is great and they have made it charming and service oriented. We would stay here again – go out of our way even – any time. One could stay for multiple days. Only 14 miles from the coast. Rode my tour bike past this spot and fell in love with the place. Peaceful and relaxing. I will return. Maple Lane RV Park & Marina is well situated for a fisherman like me. I have kept my boat at their dock during fishing season for a number of years. The owners and hosts always make my visits pleasant. I was very surprised when the Park hosted my 75th birthday party. I certainly recommend RV’ers and tent campers to stay at Maple Lane. We like it because when we’re here, it’s like our second home. It’s fun and adventurous – we hike Sweet Creek Trail to enjoy the beautiful falls. And there’s a great dead end road that’s 5 miles long we like to bike on. It’s a stress free environment. We love to go down by the river every morning because you never know if you’ll get fog covering the mountains until the sun comes up and burns it off or you’ll see some wildlife out for their morning meal. And at the end of our visit we just don’t want to leave! What a great place from which to explore the Oregon Coast around Florence. Fourteen miles up river from Florence, out of the wind and fog, lies this wonderful RV park right on the banks of the Siuslaw river. The owners, Mark & Sharon are extremely helpful and friendly. Fish from the docks, or run down to Florence for dining and shopping. 46 RV sites, 9 of which are pull-throughs. Also, there are sites overlooking the river. Grocery store so close it takes only a minute to drive to. Stop here for awhile, you’ll be very happy you did. Maple Lane RV Park is a great campground, just 13 miles from the great sand dunes of Florence and the Pacific Ocean. Very quiet and peaceful. We love sitting on the bank of the Suislaw river and watching all the different birds playing. They have the cleanest restrooms and laundry room, awesome hosts that help you into your site and beautiful tent sites right on the rivers edge. I camped here twice in Sept. 2014. Great and very clean facilities including shower, laundry and firewood available. Excellent river side setting with boat launching and dock available. Super friendly and knowledgeable personnel supports your needs up to late evening. No better place for a river fishing trip or casual camping in Oregon. I love it. I found the park very clean as well as the facilities. Good wi-fi. Great view from an outside covered cooking island. Local land marks (Sweet Creak Falls), and the coastal activities are just 14 miles away.Very peaceful area, and so quite at night. This may be publicized as an RV park, but it is GREAT for tent campers too. Nice spot by the river, nice clean bathroom and shower, laundry room AND internet. And all for less than one would pay at a state park!! Friendly hosts too. I thought I was lucky to find it on my road trip. Thanks! Copyright © Maple Lane RV Park & Marina LLC. All Rights Reserved.